She's got four amazing kids, a rock star husband and a smile that makes you smile back. This month's "What's in Her Bag" contributor is Natalie Hanson. 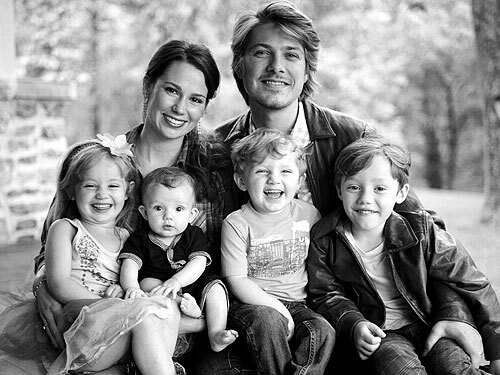 The gorgeous mother of four, and wife of Hanson member Taylor Hanson, shows us what's inside her busy rock-n-roll Mom bag. From the school run to a night out with friends Natalie takes us on a tour of the items she carries with her as she navigates her very lovely life. I am always looking for something that can function as a “motherload” carryall, yet, is chic enough that when I am out without the children, is not a dead giveaway of my day job! This is the Mini Excursion bag by JW Hulme Co. I love its well-constructed, classic, made-for-using vibe. I love tying scarfs on my bags! It’s an easy instant update. I inherited a beautiful scarf collection from my grandmother, so mine are also a sentimental touch. This one is a souvenir from Hot Springs National Park in Arkansas. The wallet I’d been using since high school recently bit the dust! While I miss the memories, this one makes looking forward a little easier as I am a big time Kate Spade fan and just about everything of theirs makes me smile. My shades. The gold accents remind me of Elvis. TCB. Snacks are a mommy must have for when we are out and about and in between meals. My Pretty Little Things. Jo Malone perfume. They are so fun to mix and match and smell so fresh. The polish is Sparitual, Dreams Becoming Reality, my polish of the moment and, Thunder Road, my little girl’s current favorite. The lip gloss is Revlon Papaya. I tracked this color down after seeing Lucy Hale wearing it on the cover of Teen Vogue. It is my perfect summer shade! I love my Kindle! My current reads are The Help and A Love that Multiplies. I always carry pen and paper for jotting down my lists, and it doubles as a tried and true child distraction technique. My mom-of-four status means I’ve been carrying diapers in my bag for 8 years now! This also means I have burned out on carrying anything extra. This little pack is sturdy and carries several diapers and wipes, and it's all I really need.